← Another Earth might be the best sci-fi film of the year. Here at The Filmsmith we have followed the development of this project, from filling you in on the debut of the trailer, to including it in our list of anticipated films. When it was at Cannes, we covered it from afar, and when it seized the top prize, our enthusiasm reached its apex. But now that it has been seen, can it possibly hold up to our vast expectations? In short, no. No film is ever quite what you think it will be, especially one shrouded in mystery, which Terrence Malick’s films tend to be. The better question is whether or not it disappointed. The answer to that is a resounding no, also. 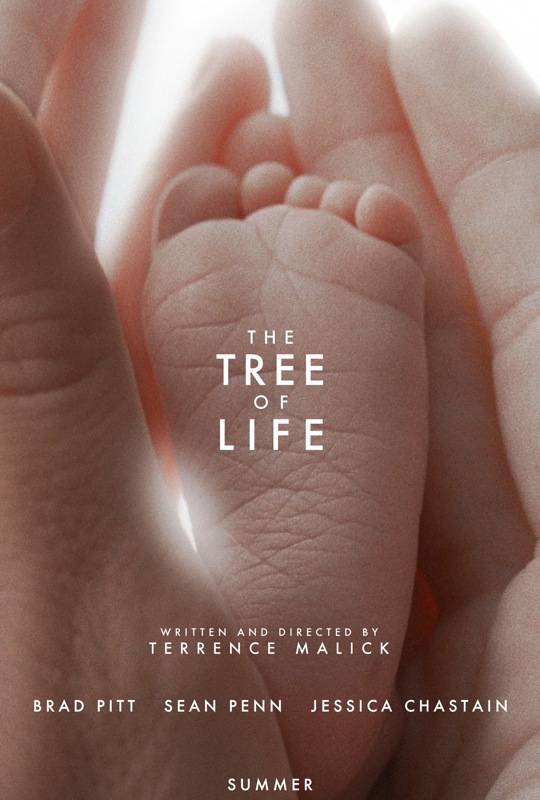 It was an altogether strange film, challenging in many regards, and far more experimental than even Malick has produced before, but none of this stopped it from being an incredibly moving portrait of childhood that managed to ask questions about life and death, good and evil, nature and grace. It really blew my mind. Due to the fact that much of the film is in the form of memory, and there is an elliptical element to its narrative, it is almost impossible to discuss any of the plot developments without revealing some aspect of what might be considered a spoiler. Heck, I wouldn’t even know where to put a spoiler alert, except that I know many people wish to know very little of this before seeing it. If you are in that group, go see it, and then come back to read this review. His father, played by Brad Pitt, follows very assuredly the way of nature, which only wishes to please itself. He likes to have his own way, and make sure that others acknowledge it. The world is his oyster, and he has shucked it for all that its worth. He wants his sons to be like him, aggressive and masculine, even in one scene attempting to provoke each of them in turn into hitting him. Jack remembers one summer, from the vantage point of adulthood, in which everything changed for him. He saw the beauty in the world, saw the love that shines through all things. But this summer in particular, those images began to fade. He witnesses the death of a friend who had done nothing wrong, and is forced to come to terms with the meaninglessness of death. He sees disease and sickness surrounding him, all of the pain that is in the world is at his fingertips, and he tries to reconcile this with his faith and the path of grace that he has always followed. This is where he begins to see his father’s point of view, and understands that seizing the world is the only way to be the boss of your own life. “Only by fierce will and determination” can he refuse to be subject to these arbitrary tragedies. He even asks God in one instance, why he must be good, when God so obviously isn’t. But then the unthinkable happens – his father loses his job. The family lived perhaps better than most, without actually being rich. But they can no longer afford the house they live in, and they move away. This sends a shockwave through Jack, who molded himself after his father as a form of protection against the cruel world. It seemed that if he could be cruel he could be untouchable–but now but his father, giant among men, has been felled in one blow. These recollection of Jack’s childhood are bookended by a journey through the birth and death of the universe, as Terrence Malick imagines it, images of stark beauty (almost none of which were done with CGI). As planets form out of gas, and life begins, there is a much talked about sequence with dinosaurs. But this quickly moves on, and heads towards Jack’s birth,and infancy. We actually watch Jack age up until this particular summer begins, and it is quite astonishing watching him grow. As far as the performances go, the children play great believable children, but they were all nonprofessionals, chosen to act as themselves. Brad Pitt and Jessica Chastain (the mother) really shine though. It would have been far too easy to depict the father as a cruel tyrant, but Pitt humanizes him, revealing his cruelty to be an aspect of his own weaknesses, or of his attempt to be a better father. He truly wants the best for his son, and loves him just as much as his wife, but that can be forgotten behind the mask of brutality. Chastain, still a fresh face, is fantastic. Her radiance and sincere stoicism really bring home the essence of her character. She has few lines, but through her silence she says so much. Many people have compared this film to Kubrick’s 2001, and that comparison is warranted. But it seems to me more like the work of Russian filmmaker Andrei Tarkovsky (Solaris, Andrei Rublev, The Mirror, Stalker). Both Tarkovsky and Malick are dealing with our experience of time through elliptical editing, and relationship with natural, through visual cinematography. But perhaps even more than that, Malick (like Tarkovsky and Kubrick, both) is honing in on the grandest of issues, like our relationship with the universe, how the minuteness of our lives plays out cosmically. He is dealing with the question of why there is something, when there could just as easily have been nothing. But these are the questions that have no real answers, at least none that really satisfy, only new and more profound ways of asking them. Where Malick succeeds in satisfying us is in giving us a story that is universal. It is the story of every person that has ever loved or suffered, which is to say that it is all of our stories. The particulars (e.g. names, places, times) are hidden behind clouds of DDT or behemoths of glass and steel for a reason. This city is every city. This childhood is every childhood. This life is every life. This entry was posted in Reviews and tagged Andrei Tarkovsky, Brad Pitt, Stanley Kubrick, Terrence Malick, The Tree of Life. Bookmark the permalink.